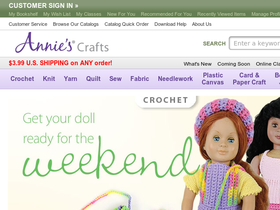 Go to Annie's, online at AnniesAttic.com, your online home for knitting, crochet, and other crafts. Annie's is the stop for finding the best yarns at great values and a huge selection of crochet and knitting patterns to match a variety of styles and personalities. Annie's also offers crafts for beading, plastic canvas, cross stitch, card making, and more. Whether you're a beginner or a seasoned knitter, Annie's has a pattern for you. Plus, AnnieAttic.com makes it easy to get patterns through download. So shop at Annie's and enjoy great craft supplies, and be sure to get all the latest AnniesAttic.com discounts, Annies Attic promotions, and Annies coupon codes found here at RetailSteal.com. Annie's ships within the United States and Canada. Shipping rates are based on total order cost. There is an extra charge for rush delivery. See site for details. Annie's is the place to save up to 80% savings on knitting, crochet, and beading kits and other crafts in clearance. Get started today and save. Act now and enjoy up to 50% off a wide range of fabrics from AnniesCatalog.com. Shop for yarn online at Annie's Attic and enjoy up to 60% off a wide selection of sale yarn. Shop at Annie's Attic and enjoy $4.95 flat rate shipping on orders $10. Click here for code. Save 20% on any Annie's Attic purchase with this coupon code!